4/21 – Training & BOSTON! What a race! 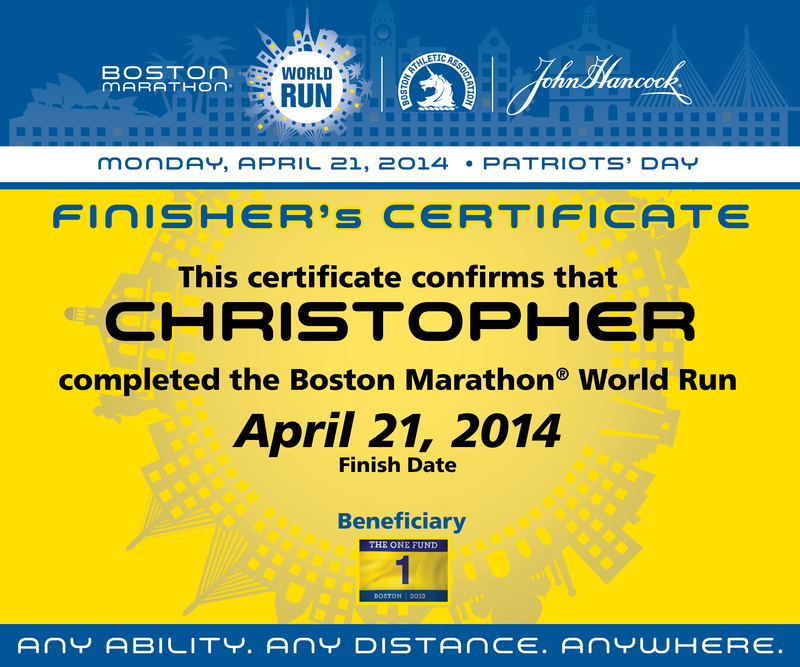 Boston this year was thrilling from the start all the way to the finish. I was pounding the table begging Meb to kick down Boylston and break the tape. Come hell or high water, I’m going to BQ and cross that finish line myself someday soon. My time won’t ever rival Meb’s, but knowing that we ran the same course and crossed the same finish line will be pretty cool. In the mean time, Meb is going to be the Guest of Honor at this year’s RunFest so if I’m really lucky I might be able to get a picture. Fingers crossed. But before I get to Boston, I have to finish Glass City (and graduate law school, find a job, and BQ). This past week has reinforced to me just how bad I am at tapering. It is likely the type-A, competitive side of me coming out, but even running alone I have trouble not running at race pace or tempo pace. This is something I will definitely need to address before I injure myself through overtraining. Both in terms of pace & mileage, I need to learn to dial it back when needed. Pre-workout: the dreaded Tri-berry GU! As it turns out, Tri-berry is not too bad. It actually is probably my favorite of the “fruity GUs” which is damning with faint praise. None of them will dethrone the Vanilla, Chocolate, Peanut Butter, & Espresso flavors however. Since it is the week of the half marathon, I know I need to taper and conserve strength. So I decided to just run 5 miles this morning – nothing too long. But there is a clock hanging over the indoor track at the UT Rec Center and I find myself competing with the clock when I run there. Today wasn’t different. I really need to be looking at my Garmin and adjusting my pace accordingly. I seem to be able to dial into a fast pace based on feel, but when I try to run easy I keep creeping faster and faster until I’m back at HMP. This summer I am planning on doing some ultrarunning / trail running, so I’m hoping the increased distance will help me keep my pace reasonable. The first attempt is going to be the Licking County bike trail from Newark to Johnstown. The debate right now in my head is whether I should do the roundtrip or run one-way and have Stacy pick me up in Johnstown. This entry was posted in 1/2 Marathon Training, Boston Marathon, Training and tagged 1/2 marathon, Boston, Indoor track, Pacing, Rec Center, Training by Christopher Orr. Bookmark the permalink. Overtraining is the worst. You do the hard work, you get injured, you have to sit out a few days, and you are hitting yourself in the head for being so dumb and not being able to run anymore.